71 year-old man seriously wounded in third stabbing of the day. 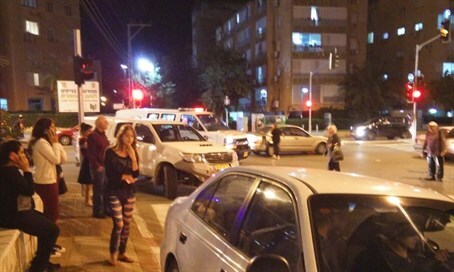 A 71 year-old man has been critically wounded Monday evening, in a stabbing attack in Netanya, north of Tel Aviv. The attack unfolded at approximately 5:50 pm local time, when the terrorist stabbed the man on Tachkemoni Street, off of Binyamin Blvd. Magen David Adom (MDA) medics treated the man for stab wounds to his upper body and transferred him to Laniado Hospital, where he is listed in serious condition. Channel 10 has updated his condition to critical. The terrorist, a 22 year-old Palestinian Arab resident of Tulkarm in northern Samaria (directly east of Netanya - ed. ), was shot and neutralized at the scene and is also seriously injured. Police forces have swamped the scene and launched an investigation. This is the third stabbing Monday. On Monday morning, one Arab terrorist was shot dead and another arrested near Jenin, in Samaria, while attempting to stab IDF soldiers. And hours ago, a 19 year-old Hevron man stabbed three people in Rishon Lezion.